Elegant tea and pastry salon also renowned for their macaroons. The Café Jacquemart-André is open daily from 11.45 am until 5.30 pm (lunch from 11.45 am to 3 pm and snacks from 3 p.m to 5.30 pm). The brunch is served each Saturday and and Sunday from 11.00 am to 3.00 pm. Late night opening on Mondays and Saturdays until 7 p.m. during exhibitions. The Café is accessible independently of the Museum. Legendary belle-époque tea salon across from the Tuileries. Best known for the hot chocolate. Open from Monday to Thursday from 7.30 am to 7.00 pm. Onfridays from 7.30 am to 7.30 pm. On weekends and bank holidays from 8.30 am to 7.30 pm. This tea-rooms are a Paris institution for good reasons : the best Macaroons, amazing sweets and light eats. From Monday to Thursday from 8.00 am to 7.30 pm. Friday and Saturday from 8.00 am to 8..00 pm. Sunday and Bank holidays from 10.00 am to 7.00 pm. Monday to Thursday from 7.30 am to 11.30 pm. Friday from 7.30 am to 12.30 am. Saturday from 8.30 am to 12.30 am. Sunday from 8.30 am to 11.30 pm. Institution of the left bank where the ambiance still lives up to the hype. Perfect for a drink and people-watching. 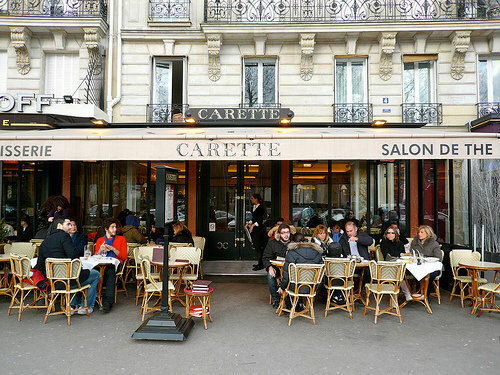 This famous café is located on Blvd St. Germain, next to its rival Café Les Deux Magots. The café really has an aura all of its own and it mutates seamlessly through the day from breakfast rendez-vous via tea spot and aperitif hour to late-night drinking haunt. Open daily from 7.30 am to 01.30 am. From Monday to Friday from 8.30 am to 7.30 pm. Saturday from 8.30 am to 8.30 pm. Sunday and holidays from 10.00 am to 7.30 pm.